Somehow I thought it would be a good idea to bike commute every work day in October. 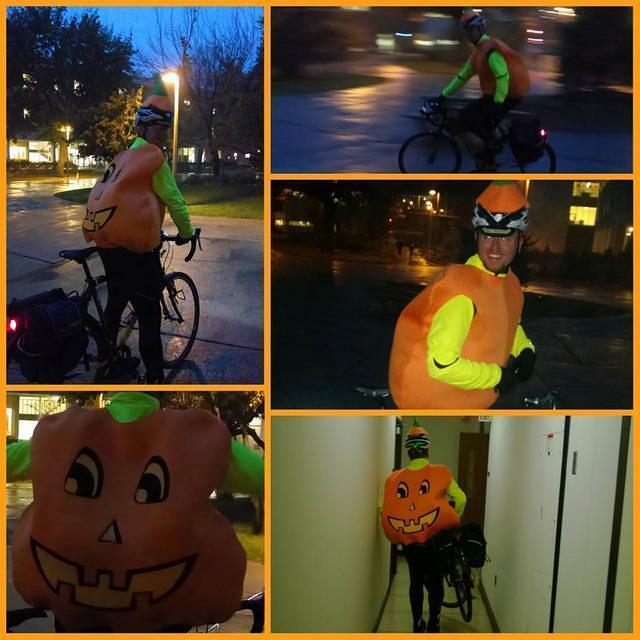 As a reward for my insanity, I would dress up as a pumpkin for my ride on Halloween. 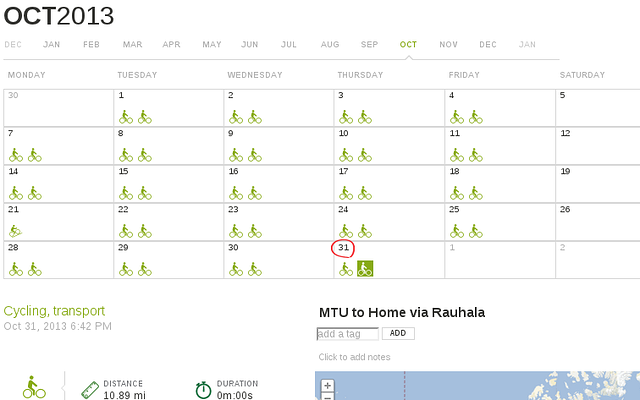 So how was my most consistent month of bike commuting ever? Not bad. I stopped getting tired near the ends of the weeks. I'm getting pretty good at dressing for the weather without ending up too hot or cold. And I saw some of the most amazing sunrises ever this month. Maybe I'll take tomorrow off, but then I'll be back at it. Give me a friendly beep if you see me on the road! Also, you gotta know when to hold 'em; know when to fold 'em. Et cetera. Somehow I didn't think about hydration or nutrition for a 9-mile run. I quite possibly was confusing running with cycling. At any rate, I didn't cramp up or pass out, though I'm told I sweated a lot. Hey, you try being a big lumbering dude sometime. 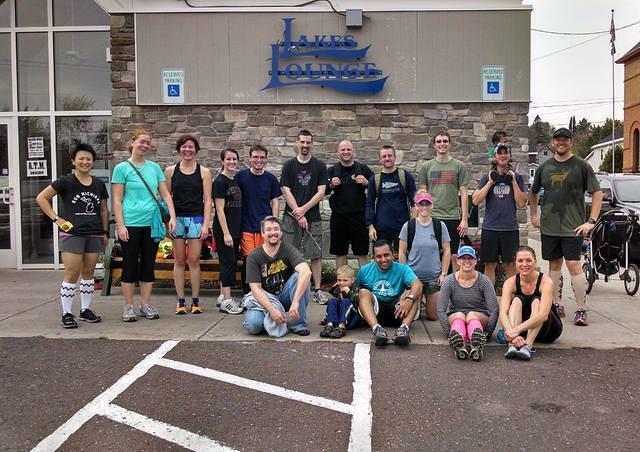 Anyway, it was lots of fun to run with a group, and I think we're going to try to run and/or bike a couple of times a month. If we can manage to keep the group runs going through winter, that will help a lot for any spring race training. The weather was perfect for a change. This was good because between people getting lost on the way (I realize I said "park" instead of "campground"), and maybe one or two people having more or less just rolled out of bed, it was relatively pleasant standing in the parking lot. Once everybody showed up, we gathered around while I described the course using phrases like "it sort of goes," "you kind of turn," and "giant ravine." At precisely 11:37, we took off up the hill. Deidre, Amy, Nancy, and Andi formed a nearly-impenetrable lead pack until Dave flipped the hidden battery assist switch on the stroller his son was riding in. I stayed back, checking once or twice for lost people behind me. At the first mile mark, I finally dropped G after making him laugh, but didn't keep my place for long, as Kristin motored by with a look of determination on her face. Coming around the big loop, the final climb inspired whining from runners and amused looks from disc golfers. The ravine section was reported to be no problem, though the campground loop was universally demoralizing. At least there were no lawnchair hecklers. Ann and Duncan made up 100% of the official event spectators, and directed runners toward the finish line. The finish included some great feats, including a seriously impressive effort by Kelly (carrying a 15-pound rucksack), a last-minute breakaway by Colin, and Martin wearing all the clothing he started with. 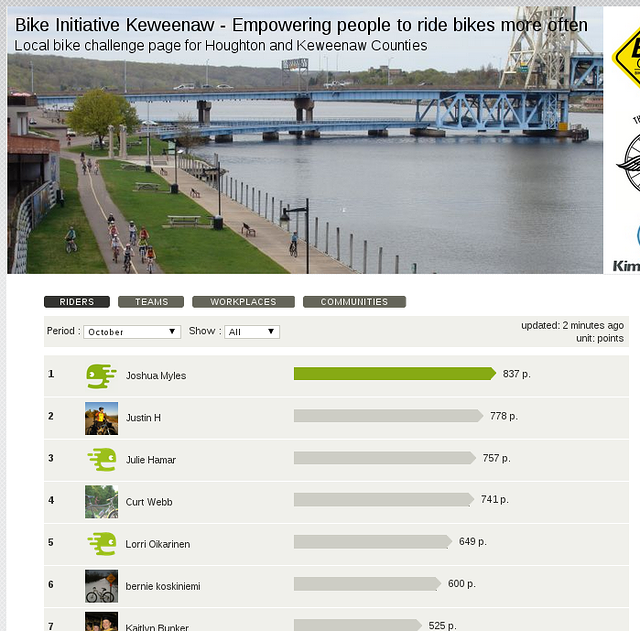 Not to mention Steve and Rob carrying an extra 30 pounds each, Heather making a solid finish even after revealing her mystery identity, and Cayce figuring out this running thing well in advance of the end. I'm sure all of the runners who finished before me were equally amazing, so cheers to all you fast people too. So this was fun. You guys were great, and you'd all better come back next year.